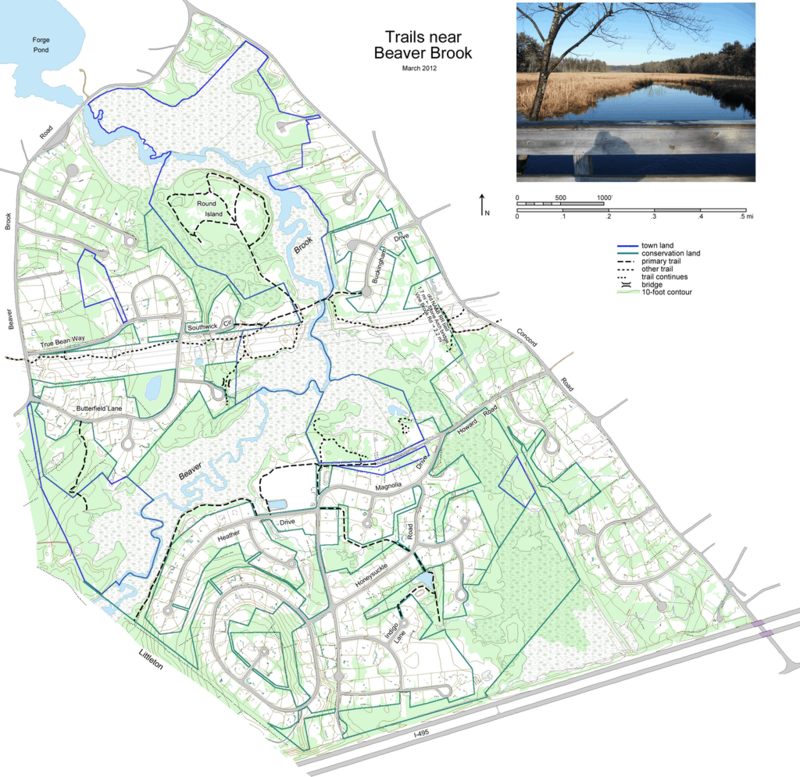 Beaver Brook is one of several natural watershed drainage basins in Westford. Heading northeast, Beaver Brook meanders through Westford creating a true wildlife haven for the many species of wildlife and vegetation. June through August you will see the rose-purple blooms of the swamp milkweed and the Broadleaf-Cattail offering a convenient perch for a Scarlet Tanager or an American Wood Duck lazily enjoying a snack of local vegetation. The Beaver Brook trails offer several areas to enjoy the natural wildlife and scenery. The northern section of Beaver Brook is accessible on Buckingham Drive at the trail post between addresses #15 and #17. Heading west on the trail you will find a foot bridge crossing Beaver Brook and this is an excellent vantage point to view the brook flowing north with a wide expanse of marshland on each side. After you cross the bridge you should head northwest (right) at the junction, to a small safe haven for many local species. (This junction can also be reached from the west, at the end of the Southwick Circle cul-de-sac.) Walking counter clockwise around what was once an island you will notice several beaver lodges as the trail approaches the shore line. You will also notice the island has experienced new growth of white pine after the sand and gravel deposits were removed during the construction of Rt. 495. In the spring, you will find the Spotted Turtle or the Common Bask Turtle sunning on the banks of Beaver Brook as it winds north and then west through the meadow and marshland. This section drops steeply to the water. Is this an esker, or an artifact of the excavation of the interior of the island? You be the judge. This trail is easy to walk and provides a great variety of wild life to enjoy before Beaver Brook enters Forge Pond. The remoteness of this habitat offers an amazing diversity of wild life, from beavers and foxes to the Eastern Phoebe, a fly catcher, enjoying the insects offered by the Beaver Brook watershed. One can follow the power lines all the way from Beaver Brook Road to Concord Road. As you approach Concord Road, you ascend a linear embankment. If you think it looks unnatural, you’d be right. The Nashua, Acton and Boston Railroad ran here until about 1925. This is the same railroad that today constitutes the Stone Arch Bridge trail to the north and the long, straight trail near Nashoba Brook in the south. 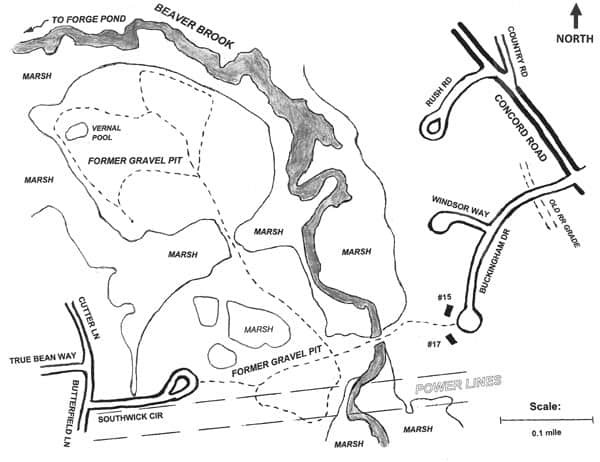 Look at the Nashoba Brook map and note how the end of Vine Brook Road was built on the rail bed. On the town-wide map on page 67, piece the three sections (Stone Arch, Beaver Brook, Nashoba Brook) into a line running near the western border of town. Other trails are worth exploring. From Butterfield Lane, you can travel south toward Littleton on the western bank of the brook. A more challenging walk but with a very rewarding vista is the eastern bank, where Beaver Brook enters Westford from Littleton. The wide marshland meadow with abundant vegetation and wildlife is accessible from Heather Drive, a continuation of Howard Road. Here you will see an occasional Blue Heron or Northern Pintail. You will also find New England’s most common duck, the Mallard, with its green neck and purplish chest nesting with a female of buffy brown plumage. The meadow is surrounded by a large stand of pine where you will find a Red-Shouldered Hawk or a Northern Harrier enjoying the marshland and swamps of the Beaver Brook watershed. Park on street near #15 Buckingham. Enter between #15 and #17. Or park at the end of Southwick Circle.